Emotional appeal in your copywriting should accomplish two things to be effective: 1) make consumers feel something; and, 2) make them take action on those feelings. Knowing your clients’ emotional ‘hot buttons’ and how to use them for empowering your marketing messages are the foundation of effective copywriting. Here are some important pointers on how to do so. Creating a successful marketing campaign entails understanding human psychology. If you want to persuade someone to buy, you must know what spurs him or her to take action. This means knowing the right emotional ‘hot buttons’ of your target audience. Simply put, emotions are the feelings that motivate buying. Using the right ones in your marketing materials is crucial for your business success. Of course, emotions in marketing really entail a broader set of feelings that motivate your target audience. More accurately, the list includes desires, behaviors, and beliefs, too. It doesn’t matter what they are called, however, as long as they induce the desired action from your marketing materials. 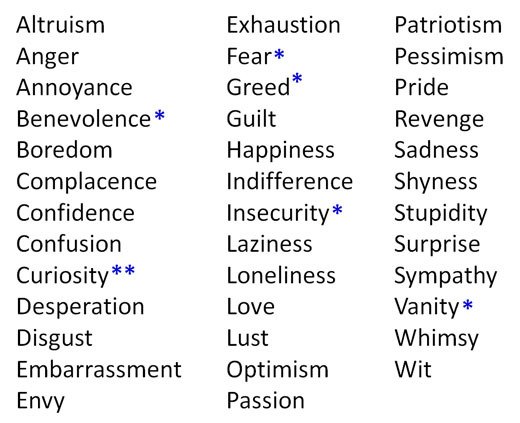 The most important of the words for emotional appeal in effective copywriting are listed in the following table. Although this list may seem overwhelming, a few of them are generally far more valuable than others. These are accompanied with asterisks in the above list. Note that curiosity has two asterisks, because of its importance in marketing. This headline works largely on curiosity because it piques the interest of even the most casual reader. Wouldn’t you want to know about a food that could help you live a longer, healthier life? Again, curiosity is the primary emotion at work here. How could anyone possibly burn disease out completely? Do people really have the power to self-heal? This headline provokes many questions in the reader’s mind, all of which lead to continued reading of the marketing materials. In this case the specific numbers in the headline stimulate the reader’s intellectual curiosity. If fires up the imagination on how it is possible to make that much money from only $5,000. It supercharges the emotion of curiosity. You may also notice that a secondary emotion evoked by this headline is greed. Having one or more secondary emotions in your marketing materials will always bring better results. Using multiple emotions in marketing is a topic that I explain further a little later in this article. Most copywriting follows the mistaken rule of thumb that everyone is motivated by fear and greed. Appealing to fear and greed is supposedly the bedrock for motivating people to buy. This is a long-held myth. You may continually hear about the “wonders” of fear and greed in copywriting. However, masterful copy goes way beyond these two emotions. While fear and greed are important emotions, using them for marketing promotions will reach only a small handful of your prospects. This strategy will consistently bring mediocre results. Think about it for a moment. Are you driven by just two emotions? Neither are most other people. Humans are capable of feeling a far wider range of emotions … from passion to indifference … from happiness to anger. Stimulating action therefore demands that you use a wider variety of emotions. Indeed, you can ratchet up your marketing results by simultaneously using more than one emotion in your copywriting. Doing so will not only impact more of your target audience, you will reach them more deeply. Do people take pride in their appearance, personal qualities, skills or accomplishments? Absolutely. Marketing that appeals to these feelings takes advantage of the emotion of vanity. Vanity rivals curiosity as a powerful marketing emotion. Indeed, entire industries are built on it. The fitness industry leads the way. Vanity is also the primary emotion for marketing diet programs, teeth whiteners, and skin care products. If you think about, vanity underlies everything that can called personal improvement, including language courses, memory courses, reading courses, etc. Products in any personal improvement industry scream, Buy this and people will notice a difference in you. In addition, marketing that appeals to vanity often goes hand in hand with two other emotions: insecurity and confidence. These secondary emotions can even used in the same marketing materials to further ramp up results. People seek material things and personal improvement because it builds their own perceived self-worth. Insecurity is the emotion at work here. It can be related to greed in marketing, too. At some level, everyone suffers from insecurity. You can see it in action by noting how many people overcompensate for it by surrounding themselves with status symbols – expensive cars, designer watches, membership in exclusive groups, high-end jewelry, etc. Marketing products and services that address people’s insecurities holds the promise that these things will make them appear important in other people’s eyes. Very powerful. Benevolence, the desire to do good, is one of the most important emotions for marketing charities, non-profit foundations, churches, children’s help organizations and the like. Who can resist a well-told story about the plight of the homeless, abuse women and children, AIDS victims, and a whole host of our society’s less fortunate? That’s why so many non-profit agencies make benevolence their main emotional target in their letters asking for donations. As you build your marketing materials to incorporate emotional appeal, the first step is to pick out the primary emotion that you want to evoke. As an example, say you are selling designer jewelry. You research your target audience and decide that the primary emotion in your marketing materials will be insecurity. Why? Because you know that your target audience consists of people who want to surround themselves with valuables that symbolize their self-worth. Expensive products such as jewelry are worn for display. This is how the wearer gets other people to see it and perceive the wearer as being sophisticated, interesting, and refined. Marketing to a primary emotion often leads to obvious secondary emotions to further boost your copywriting. In the case of using insecurity for marketing designer jewelry, two secondary emotions immediately come into play: pride and vanity. Wording in any marketing materials therefore can and should incorporate secondary emotions for truly effective copywriting. Take a look at any letters, ads, emails, magalogs, or other marketing materials that you use and look for how they incorporate any of the 38 common emotions that are listed in the table above. This may take some practice. Just highlight or mark them down as best you can. If you have none, or you aren’t sure if you have any, then you may not be using emotional appeal at all in your marketing. Or, at least, you may not be using it effectively. This is a crucial exercise for evaluating your DIY copywriting. If you aren’t sure about whether your marketing materials use emotional appeal, or how to incorporate it in the first place, please contact us for a free initial consultation. We will be happy to give your materials a once over and give you some direction on how you can improve on what you have right now by packing emotions into your marketing.